A Holiday in the Happy Valley with Pen and Pencil. A Horse's Tale - with signed letter from Twain on horses! Kurzer Brief, diktiert, mit Original-Signatur von Gustav Mahler in seiner Funktion als k.k. Hofoperndirektor. Datiert auf den 12. Juni 1907. - Original-Kuvert liegt bei. (Herkunft genau bekannt.) . Exemplar stammt aus dem Vorlass eines Botschafters i. R. (ein Urgroßvater war Kabinetts-Sekretär in der Kabinetts-Kanzlei seiner Majestät Kaiser Franz Joseph, Baron ... usw.) --- Gustav Mahler (1860 in Kalischt, Böhmen - 1911 in Wien) war ein österreichischer Komponist im Übergang von der Spätromantik zur Moderne. Er war nicht nur einer der bedeutendsten Komponisten der Spätromantik, sondern auch einer der berühmtesten Dirigenten seiner Zeit und als Operndirektor ein bedeutender Reformer des Musiktheaters. -- Im April 1897 konnte er den Vertrag mit der Hofoper in Wien unterzeichnen. Von 1897 bis 1907 hatte Mahler die in Europa herausragende Stellung des ersten Kapellmeisters und Direktors des Wiener Opernhauses inne. -- Desweiteren 310 Programmzettel / Handzettel k.k. Hof-Operntheater in Wien (also tlw aus der Zeit von Gustav Mahler als Direktor der Wiener Oper), ca. A4+, desweiteren 3 Faltkarten / Einladungskarten Theatre Pare 2. 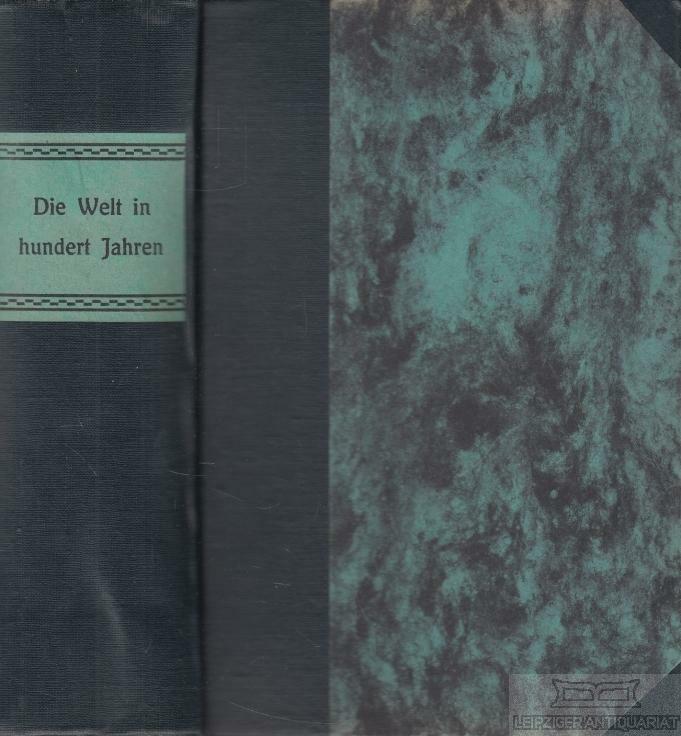 Dezember 1908 mit div. Platzkarten usw. (Bankverbindungen in Österreich und Deutschland) - Weitere Fotos gerne per Mail! London: Elkin Mathews,, 1907. Small octavo. Original green cloth, spine and front cover lettered in gilt. Illustrated title page. 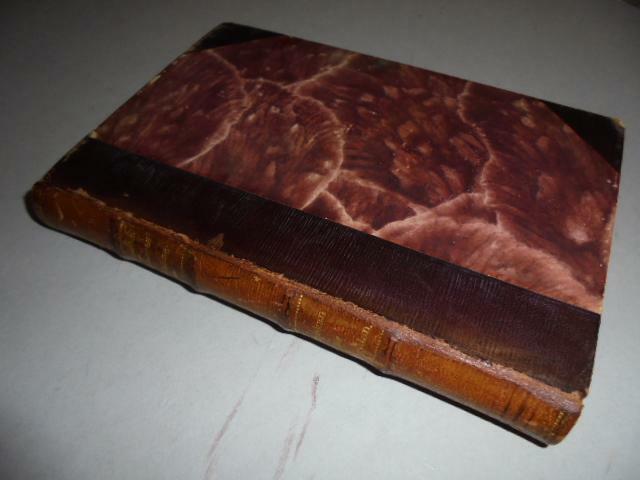 Spine faded, minor rubbing to extremities, faint mark to fore edge of front free endpaper, half-title, title page and A3, short closed tears to lower outer corners of pp. B4-C3, light foxing to endpapers; a very good, extremely bright copy. 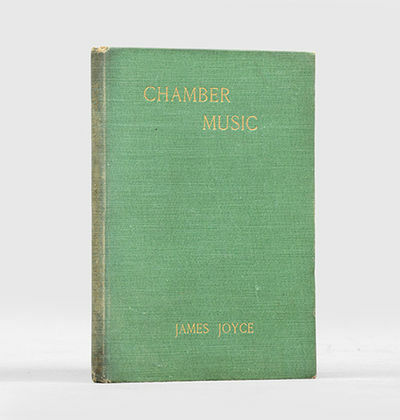 First edition, first impression, first issue, with laid paper endpapers with horizontal chain lines and correctly centred text of signature C. Elkin Mathews printed 509 copies of Chamber Music, Joyce's first commercially published work, and pessimistically bound up only a small proportion of the sheets. Bernard Quaritch Ltd argued that only "fifty or a hundred" copies of the first variant were bound in 1907 (New Series: Bulletin 19, 1984). In the wake of Joyce's later fame the remainder sheets were reissued in darker green cloth. This true first issue is uncommon. Clemens, Samuel L.]: " Twain, Mark"
American Publishing Co., Hartford 1907 - Twenty-five volumes. Octavo. Publisher's three quarter olive brown morocco and marbled boards, raised bands, lettered in gilt, t.e.g., others untrimmed. Portraits and plates. A number of the spines are characteristically sun-faded to lighter brown, occasional rubbing to raised bands and toes of a few spines, but a very good or better set, with none of the deterioration to the joints so common to this binding. 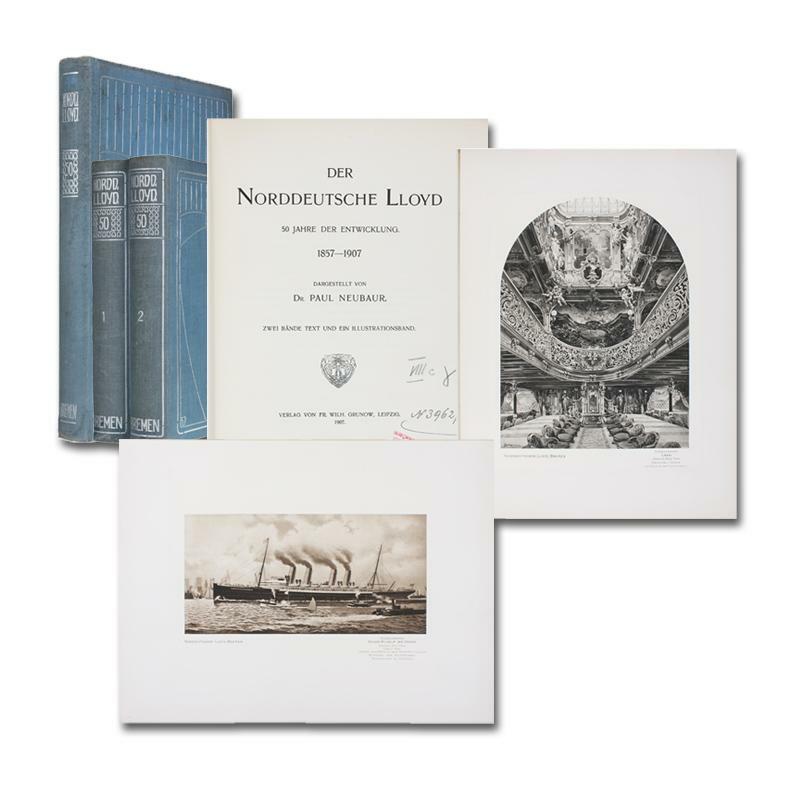 The esteemed "Autograph Edition," limited to 512 numbered sets, signed by Clemens in the first volume: "S.L. Clemens / (Mark Twain)." Eighteen of the plates are signed by their respective artist, including Peter Newell, A.B. Frost, Charles N. Flagg, E.W. Kemble, Karl Gerhardt, Dan Beard, et al. Charles Dudley Warner signed the limitation page to volume 10 (THE GILDED AGE), and Brander Matthews signed at the end of his critical essay in volume one, as usual. 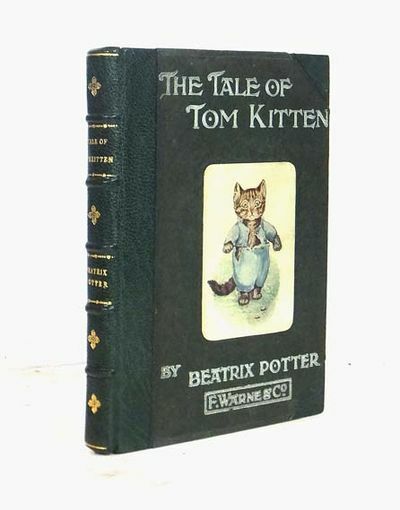 This edition was published as a subscription set in a hierarchy of bindings, and sets were occasionally customized for the purchaser by the inclusion of related manuscript leaves, letters and other inserts. 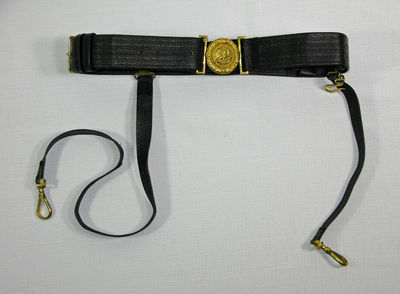 Such is the case with this set, and it is accompanied by a two page a.l.s. from Walter Bliss, 23 December 1905, to the original owner, detailing the arrangements made for Christmas Day delivery, and pointing out the location of the extra material (volumes I, V, VI, IX and X), and mentioning some extra loose plates, which are no longer present. In volume one are inserted a) a one page a.l.s. from Clemens, Riverdale on Hudson, 5 March 1902, to "Dear Bliss," written prior to departure for travels and trying to settle some publishing matters pertaining to a deal with Colliers and cancellation of another option, signed "S.L. Clemens," ca. fifty words; and b) a leaf from the autograph manuscript of THE GILDED AGE, in Clemens' hand, numbered '22' at the top margin, and beginning ".here, on the railroad & the steamboat, & say 'this' one little spot shall not be touched - this hovel shall be sacred .," ca. 125 words. 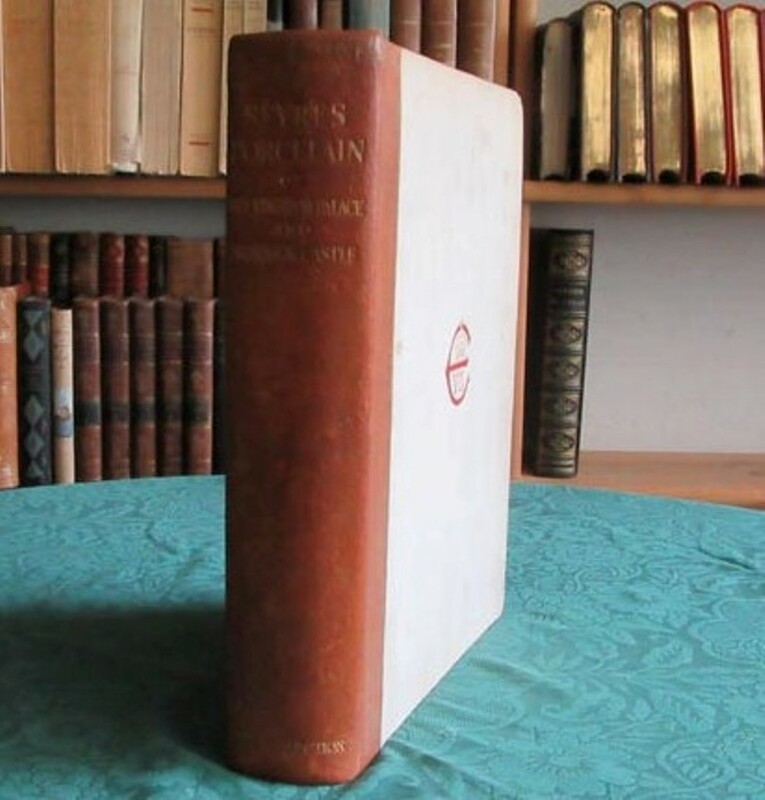 Volume V contains an extra limitation leaf from the "Author's Signed Edition" of FOLLOWING THE EQUATOR, unnumbered, but signed both as Twain and as Clemens. Volume VI includes the facsimile printing of the letter by Clemens commenting on the frontis photogravure (the image of Clemens transposed into a horse and steer drawn cart) for that special edition. Volume XI includes a) another leaf from the manuscript of THE GILDED AGE in Clemens's hand, with corrections and revisions, ca 125 words, numbered '60' in the top margin, and beginning: "'But how should I know whether they were boys or girls? '," and b) a leaf from the manuscript in Warner's hand, numbered '820' in the upper margin, beginning: "'Daft is a little strong ., " ca 150 words. Volume XI contains a third leaf in Clemens's hand from the manuscript of THE GILDED AGE, numbered '421' then altered to '1000' in the upper margin, heavily revised, with significant deletions and insertions, ca. 150 words. While sets with a single Clemens leaf (often coupled with a Warner leaf) from the manuscript of THE GILDED AGE are not uncommon, sets with multiple Clemens leaves are uncommon, and those with multiple leaves plus a letter are even more exceptional. Three of the late volumes coincided with the publication of their respective public trade editions. BAL 3456. London: Hodder & Stoughton 1907. 4to.Illustrated. Second edition, printed one month after the first. xvi, 133 [plus plates] pp. Recent half brick morocco over marbled boards. Gilt decoration and lettering to spine. New endpapers. Internally clean. With 50 tipped-in and tissue-guarded plates by Edmund Dulac bound in at rear. All plates present. . Near Fine. Half Morocco. Second Edition. 1907. In hundert Jahren. Ein Zukunfts-Roman. Cod. Bibl. Pal. Vindob. 2706. Jardin des Âmes. Reproductions Photo-Mécaniques par l'Imprimerie Imp. et Roy. de la Cour et de l'État à Vienne, Publiées avec une Préface du Comte Paul Durrieu et des Explications Concernant l'Histoire d'Art sous la Direction de Friedrich Dörnhöffer. 3 Bände in Ganzpergament. Limitierte Ausgabe. London: John Murray, 1907 First edition, first printing of an important early dystopian novel. Very good in very good scarce jacket(spine and margins darkened, some chipping to ends and corners, a bit of edge wear, short tear at spine foot, 1x2" piece missing from lower corner of front panel, splitting along length of front flap fold with three small areas still attached). Those issues notwithstanding, the jacket is integral, desirable, and rarely seen - this copy the only one at auction since its publication. Ten other copies in libraries around the country and as always these include ones without a jacket and in horrific condition - and also fine copies in fine jackets(unlikely...).We live in troubling times - a few years of indifference, blind greed, and alternative facts away from slipping into a deeper Orwellian reality. This distilment is apropos - "Nineteen Eighty-Four is about a government that is gaslighting a nation, and a nation that shrugs when confronted with gaslighting. "(Chris Taylor) Dystopia is a word that is permeating our lives and with good reason. Bramah's book is a novel describing the overthrow of a democratic British government, along with some cool future tech dreams like flying trains. It's not a great story on its own, but it has the important distinction of being an influential work. Orwell credited this book as an inspiration for Nineteen Eighty-Four. 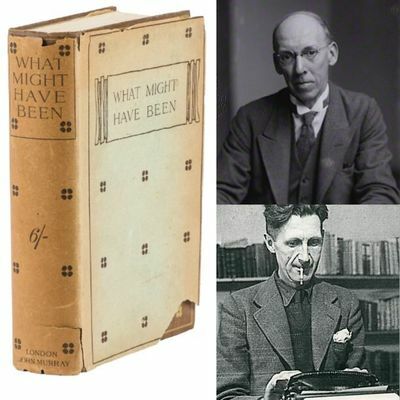 While Bramah won't achieve the heights of Orwell, he deserves recognition and remembrance for influencing one of the 20th century's most consequential writers. Dent, London., 1907. 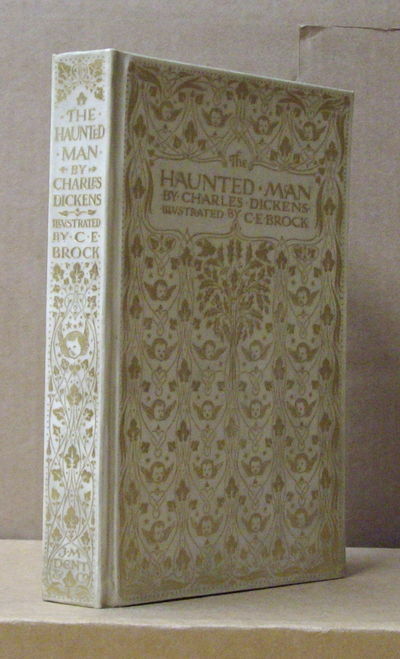 First edition thus: illustrated by C.E. Brock with colour plates and drawings in the text. Octavo. pp viii, 184. Publisher's much scarcer de luxe binding of full vellum with elaborate gilt decoration, top edge gilt.Free endpapers faintly tanned. Near fine. London: Frederick Warne and Co., 1907. First Edition. Sexto-Decimo (14 x 11cm). Illustrated with 27 colour plates. 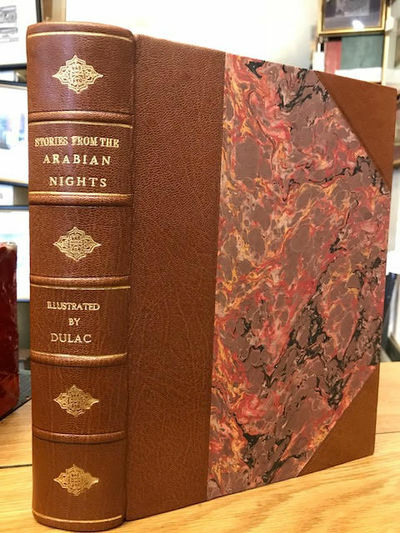 Publisher's paper-covered boards, illustration laid-down to upper, finely respined and cornered in recent green morocco, raised bands, gilt titles and gilt to spine. A very good copy. Quinby 13. HMSO,, 1907. 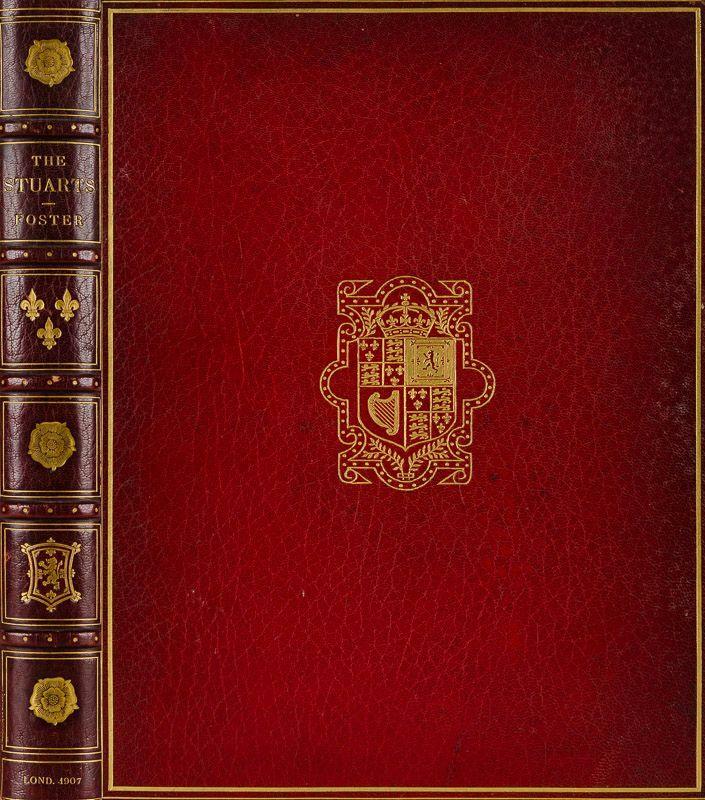 Folio, title in red and black, with 39 fine plates of portraits (2 in photogravure and a number with 2 portraits), very numerous heraldic illustrations in the text and 14 large folding pedigrees; blue buckram gilt, gilt back, gilt top, uncut, a very good, clean copy. EDITION LIMITED TO 500 COPIES. Sold from an institution with its cancelled bookplate, small neat stamp on half-title, title, dedication, throughout the text and on versos of plates, small neat labels on folding pedigrees and neat number on back. 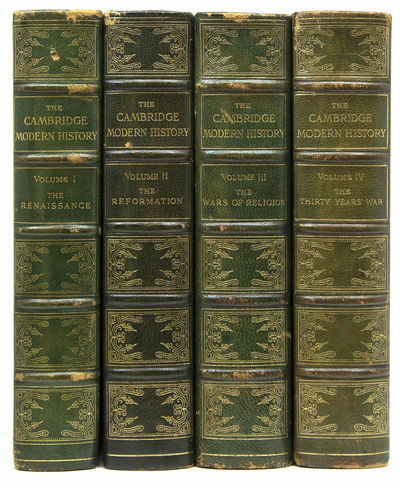 ONLY TWO OF THESE MAGNIFICENT GENEALOGICAL VOLUMES WERE EVER COMPLETED - THE PRESENT WORK AND THAT FOR NORTHAMPTONSHIRE. THE GREAT MAJORITY OF COPIES ARE IN INSTITUTIONAL HOLDINGS AND IT IS RARE FOR EITHER VOLUME TO APPEAR FOR SALE. Cartoline con figure e volti femminili (mm 140x90 ca), in prevalenza attrici e cantanti: - n°83 cartoline in bianco e nero, o colorate, senza alcuna indicazione: 76 non scritte, 5 scritte e 2 viaggiate. - n°3 cartoline raffiguranti Borelli Lyda, 2 in bianco e nero ed una a colori) - n°1 cartolina raffigurante de Nadair in bianco e nero colorata; - n°1 cartolina raffigurante E. de Vère in bianco e nero - n°2 cartoline raffiguranti Declos in bianco e nero colorata - n°1 cartolina raffigurante M. Fealy in bianco e nero colorata - n°1 cartolina raffigurante Reta Walter in bianco e nero colorata - n°5 cartoline raffiguranti Marcelle Yrven in bianco e nero colorata (3 in b/n) - n°1 cartolina raffigurante Luisette Allain in bianco e nero colorata - n°1 cartolina raffigurante De Villers in bianco e nero colorata - n°2 cartoline raffiguranti Elisa Severi in bianco e nero colorata - n°1 cartolina raffigurante Edith Whitney in bianco e nero colorata - n°1 cartolina raffigurante Jolly Dolly in bianco e nero colorata - n°4 cartoline raffiguranti Tina di Lorenzo color seppia e b/n - n°1 cartolina raffigurante Lina Cavalieri in bianco e nero colorata - n°1 cartolina raffigurante Polaire in bianco e nero - n°2 cartoline raffiguranti Malton in bianco e nero colorata e solo b/n - n°1 cartolina raffigurante C. de Villers in bianco e nero colorata - n°1 cartolina raffigurante Fedia de Ferard in bianco e nero colorata - n°1 cartolina raffigurante Mariani Teresa in bianco e nero colorata - n°1 cartolina raffigurante Archers in bianco e nero colorata - n°1 cartolina raffigurante Zena Dare color seppia - n°1 cartolina raffigurante Jole Pians in bianco e nero colorata - n°1 cartolina raffigurante Jole Kent in bianco e nero colorata - n°2 cartoline raffiguranti Phyllis Dare color seppia - n°1 cartolina raffigurante Liane de Pougy in bianco e nero colorata - n°1 cartolina raffigurante M.elle Polownia in bianco e nero colorata - n°2 cartoline raffiguranti Maria Barrientos in bianco e nero (una colorata) - n°1 cartolina raffigurante Frl. Sromer in bianco e nero - n°1 cartolina raffigurante Wanda de Boncza in bianco e nero - n°1 cartolina raffigurante Lise Fleuron in bianco e nero - n°2 cartoline raffiguranti "La bella Tortajada" in bianco e nero - n°1 cartolina raffigurante Otero in bianco e nero - n°1 cartolina raffigurante M.elle Vèlini Th. de l'Odeon in bianco e nero - n°1 cartolina raffigurante Annita di Landa in bianco e nero - n°1 cartolina in bianco e nero (Carpi) - n°1 cartolina color seppia (Palermo), scritta - n°1 cartolina raffigurante Iggius in bianco e nero - n°1 cartolina raffigurante Sirenella in bianco e nero colorata - n°1 cartolina raffigurante Mme. Bertha Kalich in "Kreutzer Sonata" in bianco e nero - n°1 cartolina raffigurante Lidia Gauthier in quattro differenti pose, bianco e nero - n°1 cartolina raffigurante Werra Odeo in bianco e nero - n°2 cartoline raffiguranti Maudie Sharples in bianco e nero - n°2 cartoline raffiguranti Emmy Wehlen in bianco e nero - n°1 cartolina raffigurante "La Sophia" in bianco e nero, viaggiata (19/11/1907) - n°1 cartolina raffigurante Hansi Hanke in bianco e nero - n°1 cartolina raffigurante Maryla Colonnelli in bianco e nero - n°1 cartolina raffigurante Aida di Frate, artista di canto in bianco e nero - n°3 cartoline raffiguranti Rosario Guerrero: 2 in bianco e nero, di cui una viaggiata; una in b/n colorata - n°1 cartolina raffigurante De Mornand in bianco e nero - n°1 cartolina raffigurante Miss Haslam color seppia - n°1 cartolina raffigurante "M.lle Pierat dans notre jeunesse" in bianco e nero - n°1 cartolina raffigurante Betty Darmand color seppia - n°1 cartolina raffigurante Demongey in bianco e nero - n°1 cartolina raffigurante Faber in bianco e nero - n°2 cartoline raffiguranti Carlier in bianco e nero, una colorata - n°2 cartoline raffiguranti Toledo in bianco e nero, una colorata - n°1 cartolina raffigurante Verena in bianco e nero - n°1 cartolina raffigurante Manon Loty in bianco e nero - n°2 cartoline raffiguranti Lucy Nanon in bianco e nero, una colorata - n°1 cartolina raffigurante Thylda in bianco e nero - n°1 cartolina raffigurante Billy Norton in bianco e nero - n°1 cartolina raffigurante Manuy in bianco e nero colorata - n°1 cartolina raffigurante Louise Willy in bianco e nero colorata - n°1 cartolina raffigurante Spendler in bianco e nero colorata - n°1 cartolina raffigurante Rejane in bianco e nero colorata - n°1 cartolina raffigurante Marthe Desgenets in bianco e nero colorata - n°2 cartoline raffiguranti Bresil in bianco e nero colorate - n°1 cartolina raffigurante Miss Muriel Beaumont in bianco e nero colorata - n°1 cartolina raffigurante Mabel Love in bianco e nero colorata - n°1 cartolina raffigurante Gemma Caimmi in bianco e nero colorata - n°1 cartolina raffigurante Burty e J. Derval in bianco e nero colorata - n°1 cartolina raffigurante J. Granier e Sorel in bianco e nero colorata - n°1 cartolina raffigurante Cassive in bianco e nero colorata - n°1 cartolina raffigurante Paule Morly color seppia - n°1 cartolina raffigurante Odette Valery in bianco e nero colorata - n°1 cartolina raffigurante Lucette d'Horvilly in bianco e nero colorata - n°1 cartolina raffigurante Iris Giulia in bianco e nero colorata - n°1 cartolina raffigurante Ykso in bianco e nero colorata - n°2 cartoline raffiguranti Hading in bianco e nero colorate, con due immagini per ogni cartolina - n°1 cartolina raffigurante A. Held in bianco e nero colorata - n°1 cartolina raffigurante Toutain in bianco e nero colorata - n°1 cartolina raffigurante Miss Marie Studholme in bianco e nero colorata - n°1 cartolina raffigurante Valandri in bianco e nero colorata - n°1 cartolina raffigurante Miss Lily Hambury in bianco e nero colorata - n°1 cartolina raffigurante Barnhieri in bianco e nero colorata - n°1 cartolina raffigurante Miss Grace Moore in bianco e nero colorata - n°1 cartolina raffigurante Vampa in bianco e nero colorata - n°1 cartolina raffigurante Vera Ledot in bianco e nero colorata - n°1 cartolina raffigurante Miss Robinson in bianco e nero colorata - n°1 cartolina raffigurante Chavita in bianco e nero colorata - n°1 cartolina raffigurante Ada Battke in bianco e nero colorata..
London: Hurst and Blackett, 1907. 2 volumes. First edition. With 160 illustrations from photographs and a large color folding map at rear. Thick 8vo, publisher's original navy blue cloth gilt lettered and ruled on the spines and covers. xv, 396, [4 ads]; xii, 511, [1 ad] pp. A very pleasing, well preserved and handsome set, the cloth clean and very solid, quite fresh but for the lightest evidence of shelving, internally solid and clean, the plates and folding map in excellent order. SCARCE. This is the account of the first journey taken across Africa at its widest point with "pleasure as its sole object," covering over 8,500 miles in a space of 364 days. Like much of Savage-Landor's work, these two volumes have since become fixtures in any collection of Africana. They are replete with photographs and descriptions of the circumstances of Africa at the turn of the century. 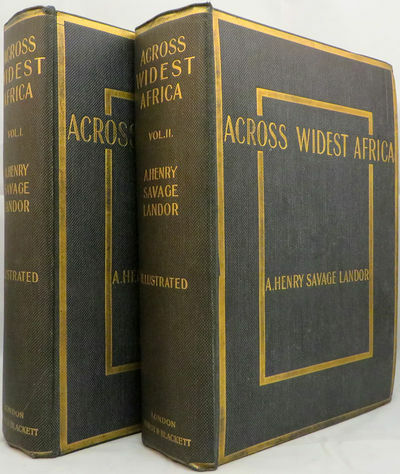 Savage-Landor is known not only for his writings of his African travels, but also his accounts of Tibet, China, South America, Europe, and numerous points in between. A desirable set of this Africana classic. London: J.M. 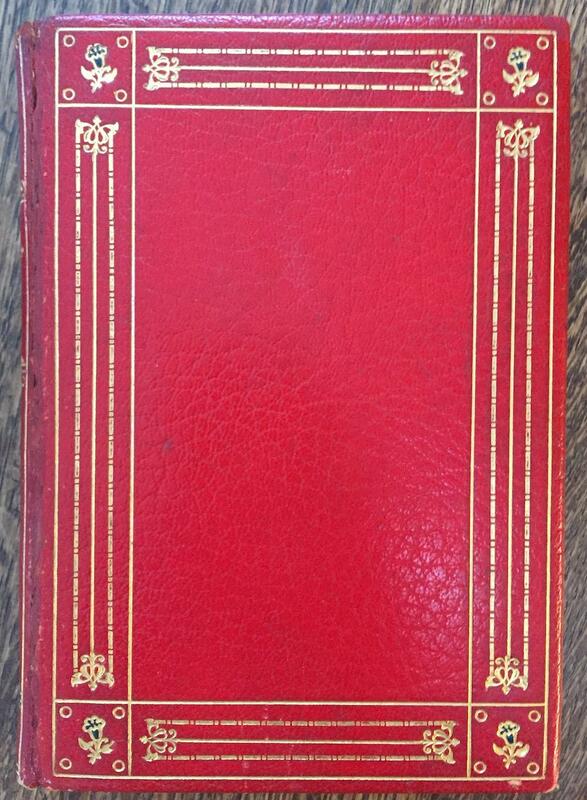 Dent & Co., 1907.. Second (and best) trade edition. Leather. Fine. 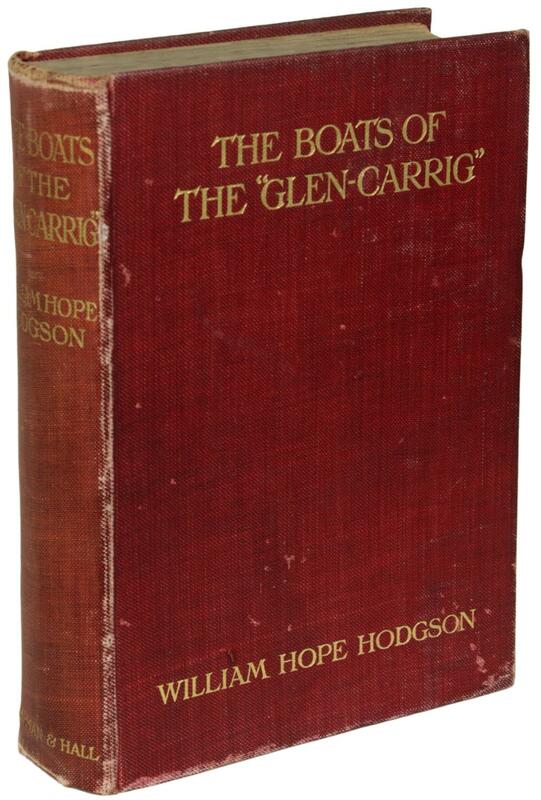 Rackham's second (and best) trade edition, revised and largely redrawn from the original 1898 edition. Quarto, bound in full green morocco, the spine with raised bands with titles and decorations in gilt, gilt decorative boards on front & rear boards, marbled endpapers, top edge gilt. 548 pp. Twenty-four color plates tipped-in on brown stock with captioned tissue guards, twelve tinted plates, and sixty-six drawings in black and white. Original cloth spine and front board bound in at the back. A little occasional foxing but overall a very attractive copy in a beautiful fine binding. The Ingoldsby Legends is a collection of myths, legends, ghost stories and poetry written supposedly by Thomas Ingoldsby of Tappington Manor, actually a pen-name of an English clergyman named Richard Harris Barham. Included are: The Spectre of Tappington; The Hand of Glory; The Witches' Frolic; The Jackdaw of Rheims; The Lay of St. Cuthbert; or the Devil's Dinner-Party: Raising the Devil: A Legend of Cornelius Agrippa; The Wedding-Day; or, The Buccaneer's Curse: A Family Legend and many many others. 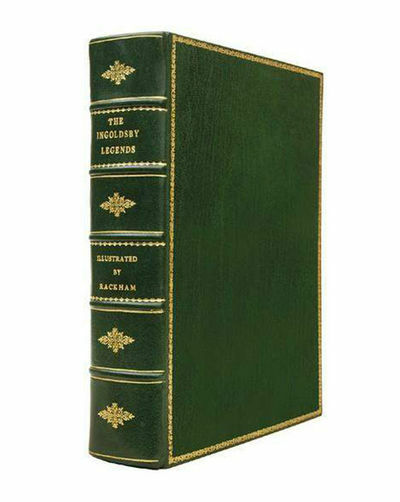 Rackham's illustrated edition is here revised and largely redrawn from the original 1898 edition, so that "greater prominence could be given to the illustrations by better and larger reproductions, including a greater number of illustrations in colour" (Rackham's Prefatory Note). Hammersmith: At the Doves Press, 1907. First edition thus, and from a small but unspecified printing by T. J. Cobden-Sanderson and Emery Walker. Small 4to, original Doves soft vellum lettered on the spine in gilt. 74,  pp. A fine copy, the text clean and fresh with just the lightest hint of the toning associated with this title, the vellum in excellent order with just a bit of the natural mottling normal to the material. A FINE AND BEAUTIFUL PRINTING FROM THE DOVES PRESS. 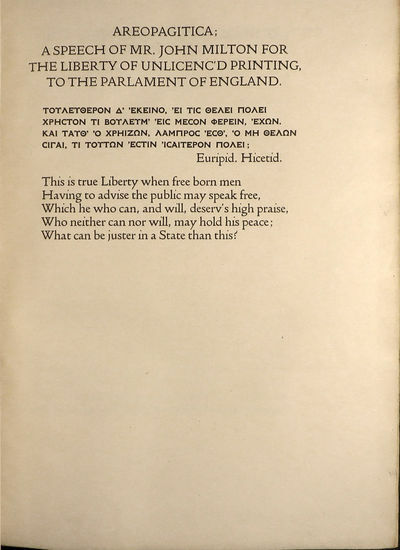 This is the text of a speech delivered by Milton to Parliament on the liberty of unlicensed printing, which has since become a standard text on free speech and freedom of the press. A well-printed and handsome edition. Perhaps the first and greatest of all writings on the freedom of the press and speech. 1907-1911. Oblong Folio (31x42cm). 20 thick card stock album leaves pp. With 206 gelatin silver photographs (most 12x17cm and slightly smaller and with three panoramas (Kuling & Shanghai) 8.5x30cm, mounted recto and verso, many with manuscript black ink captions in English on mounts. Original full pebbled cloth album. Overall album is in very good condition with very good strong photos. The interesting strong vernacular images in this album taken by an British expat show views in Tsingtau (Qingdao), Kuling (Lianxi), Laushan (Laoshan), Hankow (Wuhan), Wuchang & Shanghai. 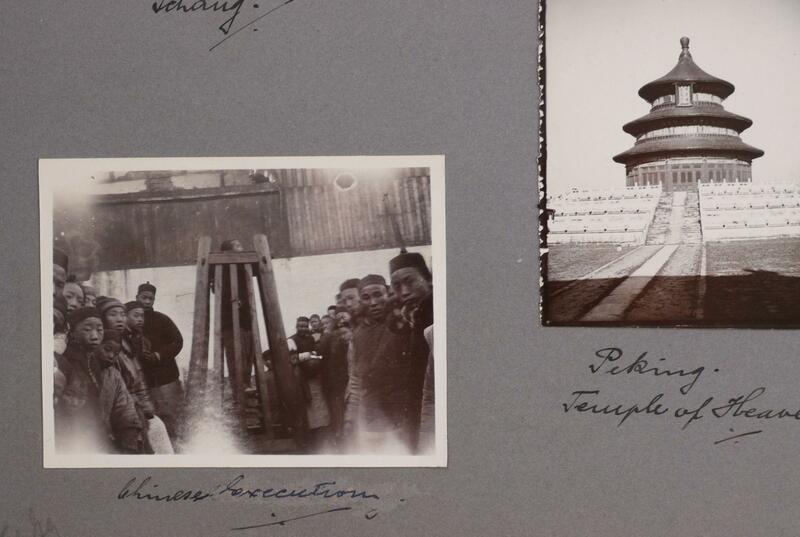 ''This album provides a record of a British expatriate's life and travels in China at the beginning of the 20th century. The photographer would appear to have worked for a trading company in Hankow, part of present-day Wuhan. The album starts with images of Tsingtau (Qingdao) showing Germanstyle residential and civic buildings, the Tsingtau races of 1907, views of a fire at the godowns of a European company (A.P. & Co.); these are followed by images of Europeans relaxing and bathing at Kuling in Jiangxi province and the Wuchang lakes plus a series of views of Laushan (Laoshan), the hilly area outside Qingdao. There are then 11 photographs of employees of A.P. & Co. Celebrating Christmas in Hankow in 1908. A few photographs represent the expatriate resort of Kuling in 1909 and scenes on the Yangtze near Nanjing. Thereafter are all views of buildings, the river and boats taken in Hankow, followed by a number of photographs of people and places including a couple of the Shanghai races of 1911. The following photographs feature Chinese people, foreigners enjoying a river trip near Shanghai, then a lively series of photographs of races and an expatriate Gymkhana in Hankow in 1910, including ladies in full Edwardian dress and large hats engaged in a race, and a photograph of ladies in rickshaws ready to be pulled by expatriates (in a race?). These are followed by photographs of tennis, and 3 panorama-style photographs of Shanghai, including one just down river of Soochow Creek and a view of the creek. The final page ranges from Loochow Pagoda to Ichang, the Temple of Heaven in in Beijing, Chinese execution and the Tientsin Fire bell. The album is of considerable merit in that the majority of the photographs are of places and scenes other than the more 'usual sights of Beijing and Shanghai' (Western Travellers in China). Der Norddeutsche Lloyd. 50 Jahre der Entwicklung. 1857-1907. 2 Textbände und Atlasband. 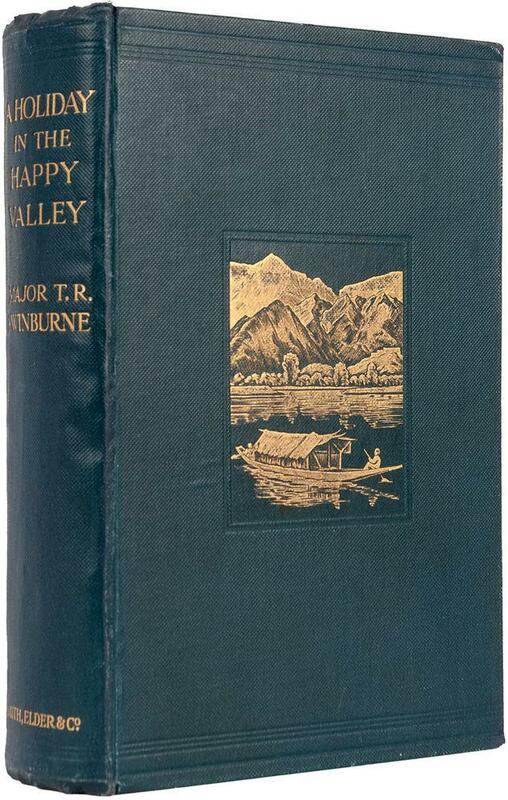 1907. run of 1897-1948 in hardback, please enjoy them. 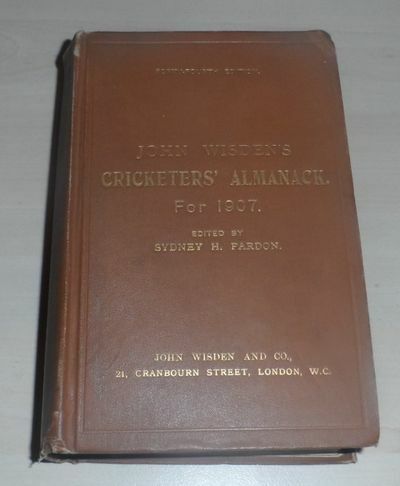 -------------------------------------------------------------------- This lot is an 1907 Original Hardback Wisden. 10th Hardback! In Very Good+ Condition. This book is very nice, it has had no restoration, the front board is very nice with shiny, original gilt, the spine cloth is a little dark but the gilt is still shiny, internally it has strong hinges and very nice pastedowns and pages, this would be a 9 if it was not for 2 Sydney Pardon (Editor) book club stamps on the pastedowns, tightly bound and an excellent photoplate (no tissue paper and small, hard to notice tear, to next page). The Writings of Oscar Wilde, Uniform Edition, Illustrated. London & New York: Keller-Farmer, Co., 1907. 15 vols., 8vo, (volumes unnumbered, see below for pagination and plates) title-pages printed in red and black, additional illustrated title-page to each volume. Modern quarter calf ruled in blind, marbled paper boards heightened in gilt, backstrip with five raised bands, lettering, rules and flourishes in gilt to panels, top-edge gilt, other edges uncut, many leaves unopened. Some minor foxing and age toning at outer margins and gutter, a beautifully bound set with striking marbled paper and beautifully printed illustrations; very good. Florentine Edition, number 203 of 450 numbered copies. 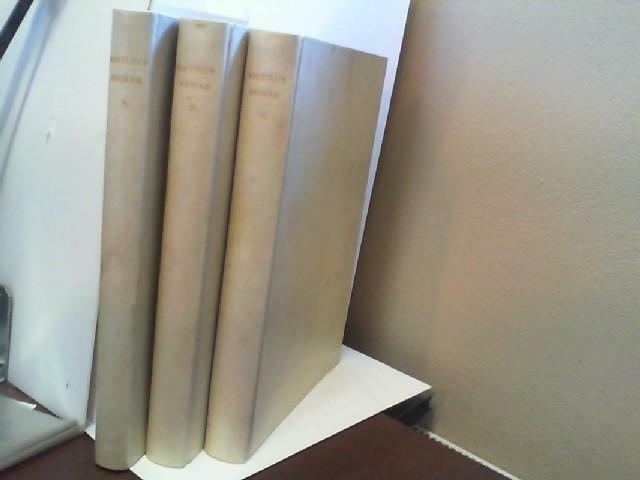 The Picture of Dorian Gray, -406 pp., four plates with captioned tissue guards, including frontispiece. The House of Pomegranates, The Happy Prince, and Other Tales, -262 pp., four plates with captioned tissue guards. 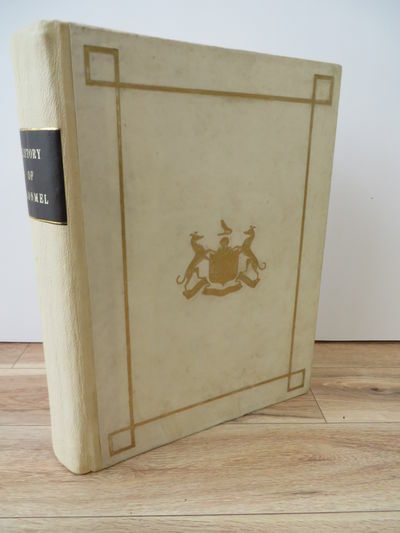 Lord Arthur Savile's Crime, The Portrait of Mr. W. H., and Other Stories, -259 pp., four plates with captioned tissue guards. 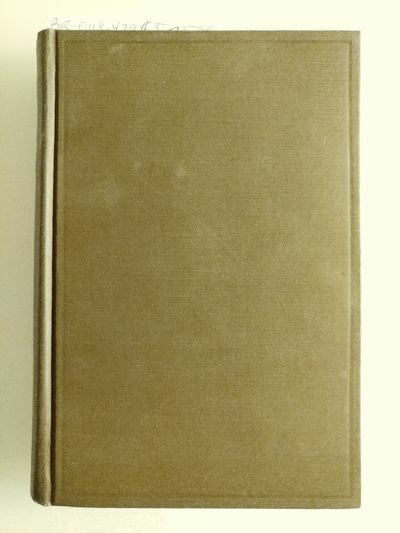 Salome, The Duchess of Padua, [and] Vera, -430 pp., seven plates with captioned tissue guards. Lady Windermere's Fan [and] The Importance of Being Earnest, -329 pp., four plates with captioned tissue guards. A Woman of no Importance [and] An Ideal Husband, -418 pp., four plates with captioned tissue guards. De Profundis. From the Original, Unexpurgated German Edition, Translated By Henry Zick, Ph. D., -209 pp., three plates including frontisportrait of the author, with captioned tissue guards. What Never Dies, A Romance By Barbey D'Aurevilly. Translated into English by Sebastian Melmoth (Oscar Wilde), -556 pp., four plates with captioned tissue guards. Poems. Including Ravenna, The Ballad of Reading Gaol, The Sphinx Etc. With an Introduction By Richard Le Gallienne, -339 pp., five plates including frontisportrait of Le Gallienne, with captioned tissue guards. Poems in Prose, -238 pp., six plates with captioned tissue guards. Essays and Stories By Lady Wilde (Speranza), -270 pp., frontisportrait of Oscar Wilde with captioned tissue guard. Essays, Criticisms and Reviews, -300 pp., four plates including frontisportrait of the author, with captioned tissue guards. Epigrams. Phrases and Philosophies For the Use of the Young, -265 pp., three plates with captioned tissue guards, and 38 pages of manuscript facsimiles. His Life. With a Critical Estimate of His Writings, x, 296 pp., five plates including frontisportrait of Oscar Wilde, with captioned tissue guards. Intentions, -237 pp., four plates with captioned tissue guards. Peter Schlemihls wundersame Geschichte. Illustriert von Emil Preetorius. London & New York: Keller-Farmer, Co., 1907. 15 vols., 8vo, (volumes unnumbered, see below for pagination and plates) title-pages printed in red and black, additional illustrated title-page to each volume. 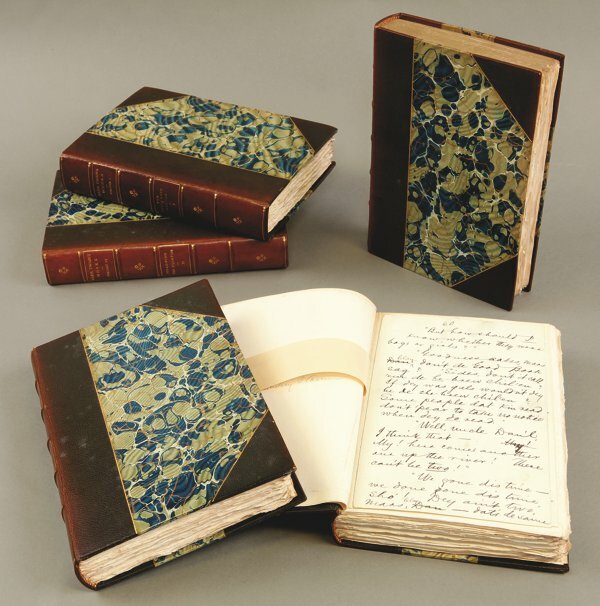 Modern quarter calf ruled in blind, marbled paper boards heightened in gilt, backstrip with five raised bands, lettering, rules and flourishes in gilt to panels, top-edge gilt, other edges uncut, many leaves unopened. Some minor foxing and age toning at outer margins and gutter, a beautifully bound set with striking marbled paper and beautifully printed illustrations; very good. Florentine Edition, number 203 of 450 numbered copies. The Picture of Dorian Gray, -406 pp., four plates with captioned tissue guards, including frontispiece. The House of Pomegranates, The Happy Prince, and Other Tales, -262 pp., four plates with captioned tissue guards. Lord Arthur Savile&#x92;s Crime, The Portrait of Mr. W. H., and Other Stories, -259 pp., four plates with captioned tissue guards. Salome, The Duchess of Padua, [and] Vera, -430 pp., seven plates with captioned tissue guards. Lady Windermere&#x92;s Fan [and] The Importance of Being Earnest, -329 pp., four plates with captioned tissue guards. A Woman of no Importance [and] An Ideal Husband, -418 pp., four plates with captioned tissue guards. De Profundis. From the Original, Unexpurgated German Edition, Translated By Henry Zick, Ph. D., -209 pp., three plates including frontisportrait of the author, with captioned tissue guards. What Never Dies, A Romance By Barbey D&#x92;Aurevilly. Translated into English by Sebastian Melmoth (Oscar Wilde), -556 pp., four plates with captioned tissue guards. Poems. Including Ravenna, The Ballad of Reading Gaol, The Sphinx Etc. With an Introduction By Richard Le Gallienne, -339 pp., five plates including frontisportrait of Le Gallienne, with captioned tissue guards. Poems in Prose, -238 pp., six plates with captioned tissue guards. Essays and Stories By Lady Wilde (Speranza), -270 pp., frontisportrait of Oscar Wilde with captioned tissue guard.Essays, Criticisms and Reviews, -300 pp., four plates including frontisportrait of the author, with captioned tissue guards. Epigrams. Phrases and Philosophies For the Use of the Young, -265 pp., three plates with captioned tissue guards, and 38 pages of manuscript facsimiles. His Life. With a Critical Estimate of His Writings, x, 296 pp., five plates including frontisportrait of Oscar Wilde, with captioned tissue guards.Intentions, -237 pp., four plates with captioned tissue guards. 20th cent.(). Etching. In: Loys Delteil, Le Peintre Graveur illustré, 1907. One of 40 copies on Japan paper, initialed opposite etching by Loys Delteil. D. 44. 6th state. Cambridge: at the University Press, 1907. 12 vols. Large 8vo. 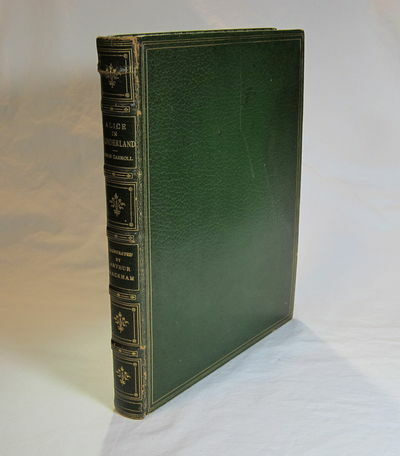 Bound in half green morocco, gilt spines, t.e.g. Very Good, some rubbing. 12 vols. Large 8vo. 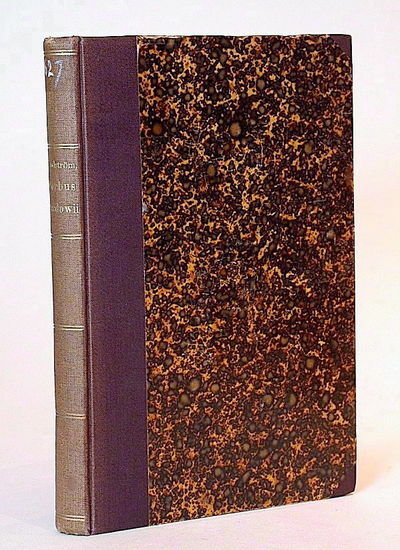 Bumpus Bookshop - Binding] Foster, J.J. 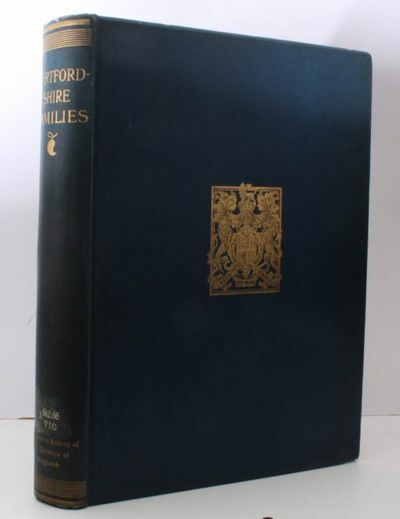 The Stuarts: Being Outlines of the Personal History of the Family. Illustrated from Portraits, Miniatures &c. in the Most celebrated Collections. Über Morbus Basedowii. Eine chirurgische und anatomische Studie. Stockholm, P. A. Norstedt & Söner, 1907.. Octavo. Pp. 196. Plus 8 plates printed on heavy paper, bound at end, with a total of 24 illustrations. Two of the plates are double-page colour lithographs; the other six plates are very fine collotypes. With 2 text figures. Bibliography. 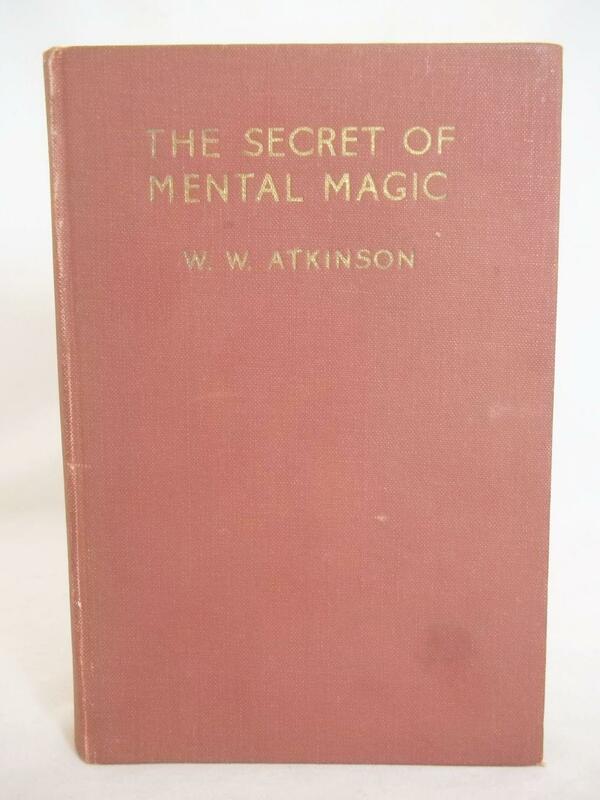 Hardcover, bound in contemporary brown half cloth and matching marbled boards, marbled edges, spine gilt, bit discoloured, fading shelf number at top of spine, old institutional stamp, small ticket. In about fine condition. Excellent copy. ~ First edition. Doctoral thesis, presented November 30, 1907. Extremely rare. "We have a recent, excellent treatise on Basedow's disease (...) in which with real Swedish thoroughness and sober good sense, Landström considers and contrasts the results of internal and surgical treatment." - (Emil Theodor Kocher, Concerning pathological manifestations in low-grade thyroid diseases, Nobel Lecture, December 11, 1909). Waterford: Printed by N. Harvey & Co. for the Clonmel Library Committee, 1907. First Edition. Full-Leather. Very Good. vi, 523 p. 14 b&w plates. Vellum covers with gold impressing. Rebacked in goatskin. Ink inscription on a front endpaper. Ink marginalia p. 5. Canon William Burke's history has long been recognized as the definitive work on the town of Clonmel. The book tells the history of the town from the medieval foundation through to the start of the 20th century. Generally known as Burke's History, surviving 1907 copies have become rare collector items. This copy belonged to Canadian historian and playwright James Reaney. It is inscribed by him as well. Cartoline con figure e volti femminili (mm 140x90 ca), in prevalenza attrici e cantanti: - n°83 cartoline in bianco e nero, o colorate, senza alcuna indicazione: 76 non scritte, 5 scritte e 2 viaggiate. - n°3 cartoline raffiguranti Borelli Lyda, 2 in bianco e nero ed una a colori) - n°1 cartolina raffigurante de Nadair in bianco e nero colorata; - n°1 cartolina raffigurante E de Vère in bianco e nero - n°2 cartoline raffiguranti Declos in bianco e nero colorata - n°1 cartolina raffigurante M Fealy in bianco e nero colorata - n°1 cartolina raffigurante Reta Walter in bianco e nero colorata - n°5 cartoline raffiguranti Marcelle Yrven in bianco e nero colorata (3 in b/n) - n°1 cartolina raffigurante Luisette Allain in bianco e nero colorata - n°1 cartolina raffigurante De Villers in bianco e nero colorata - n°2 cartoline raffiguranti Elisa Severi in bianco e nero colorata - n°1 cartolina raffigurante Edith Whitney in bianco e nero colorata - n°1 cartolina raffigurante Jolly Dolly in bianco e nero colorata - n°4 cartoline raffiguranti Tina di Lorenzo color seppia e b/n - n°1 cartolina raffigurante Lina Cavalieri in bianco e nero colorata - n°1 cartolina raffigurante Polaire in bianco e nero - n°2 cartoline raffiguranti Malton in bianco e nero colorata e solo b/n - n°1 cartolina raffigurante C. de Villers in bianco e nero colorata - n°1 cartolina raffigurante Fedia de Ferard in bianco e nero colorata - n°1 cartolina raffigurante Mariani Teresa in bianco e nero colorata - n°1 cartolina raffigurante Archers in bianco e nero colorata - n°1 cartolina raffigurante Zena Dare color seppia - n°1 cartolina raffigurante Jole Pians in bianco e nero colorata - n°1 cartolina raffigurante Jole Kent in bianco e nero colorata - n°2 cartoline raffiguranti Phyllis Dare color seppia - n°1 cartolina raffigurante Liane de Pougy in bianco e nero colorata - n°1 cartolina raffigurante M.elle Polownia in bianco e nero colorata - n°2 cartoline raffiguranti Maria Barrientos in bianco e nero (una colorata) - n°1 cartolina raffigurante Frl. Sromer in bianco e nero - n°1 cartolina raffigurante Wanda de Boncza in bianco e nero - n°1 cartolina raffigurante Lise Fleuron in bianco e nero - n°2 cartoline raffiguranti "La bella Tortajada" in bianco e nero - n°1 cartolina raffigurante Otero in bianco e nero - n°1 cartolina raffigurante M.elle Vèlini Th. de l'Odeon in bianco e nero - n°1 cartolina raffigurante Annita di Landa in bianco e nero - n°1 cartolina in bianco e nero (Carpi) - n°1 cartolina color seppia (Palermo), scritta - n°1 cartolina raffigurante Iggius in bianco e nero - n°1 cartolina raffigurante Sirenella in bianco e nero colorata - n°1 cartolina raffigurante Mme. Bertha Kalich in "Kreutzer Sonata" in bianco e nero - n°1 cartolina raffigurante Lidia Gauthier in quattro differenti pose, bianco e nero - n°1 cartolina raffigurante Werra Odeo in bianco e nero - n°2 cartoline raffiguranti Maudie Sharples in bianco e nero - n°2 cartoline raffiguranti Emmy Wehlen in bianco e nero - n°1 cartolina raffigurante "La Sophia" in bianco e nero, viaggiata (19/11/1907) - n°1 cartolina raffigurante Hansi Hanke in bianco e nero - n°1 cartolina raffigurante Maryla Colonnelli in bianco e nero - n°1 cartolina raffigurante Aida di Frate, artista di canto in bianco e nero - n°3 cartoline raffiguranti Rosario Guerrero: 2 in bianco e nero, di cui una viaggiata; una in b/n colorata - n°1 cartolina raffigurante De Mornand in bianco e nero - n°1 cartolina raffigurante Miss Haslam color seppia - n°1 cartolina raffigurante "M.lle Pierat dans notre jeunesse" in bianco e nero - n°1 cartolina raffigurante De Mornand in bianco e nero - n°1 cartolina raffigurante Betty Darmand color seppia - n°1 cartolina raffigurante Demongey in bianco e nero - n°1 cartolina raffigurante Faber in bianco e nero - n°2 cartoline raffiguranti Carlier in bianco e nero, una colorata - n°2 cartoline raffiguranti Toledo in bianco e nero - n°1 cartolina raffigurante Verena in bianco e nero - n°1 cartolina raffigurante Manon Loty in bianco e nero - n°2 cartoline raffiguranti Lucy Nanon in bianco e nero (una colorata) - n°1 cartolina raffigurante Thylda in bianco e nero - n°1 cartolina raffigurante Billy Norton in bianco e nero - n°1 cartolina raffigurante Manuy in bianco e nero colorata - n°1 cartolina raffigurante Louise Willy in bianco e nero - n°1 cartolina raffigurante Spendler in bianco e nero colorata - n°1 cartolina raffigurante Rejane in bianco e nero colorata - n°1 cartolina raffigurante Marthe Desgenets in bianco e nero colorata - n°2 cartoline raffiguranti Bresil in bianco e nero colorata - n°1 cartolina raffigurante Miss Muriel Beaumont in bianco e nero colorata - n°1 cartolina raffigurante Mabel Love in bianco e nero colorata - n°1 cartolina raffigurante Gemma Caimmi in bianco e nero colorata - n°1 cartolina raffigurante Burty e J. Derval in bianco e nero colorata - n°1 cartolina raffigurante J. Granier e Sorel in bianco e nero colorata - n°1 cartolina raffigurante Cassive in bianco e nero colorata - n°1 cartolina raffigurante Paule Morly color seppia - n°1 cartolina raffigurante Odette Valery in bianco e nero colorata - n°1 cartolina raffigurante Lucette d'Horvilly in bianco e nero colorata - n°1 cartolina raffigurante Iris Giulia in bianco e nero colorata - n°1 cartolina raffigurante Ykso in bianco e nero colorata - n°2 cartoline raffiguranti Hading in bianco e nero colorate, con due immagini per ogni cartolina - n°1 cartolina raffigurante A. Held in bianco e nero colorata - n°1 cartolina raffigurante Toutain in bianco e nero colorata - n°1 cartolina raffigurante Miss Marie Studholme in bianco e nero colorata - n°1 cartolina raffigurante Valandri in bianco e nero colorata - n°1 cartolina raffigurante Miss Lily Hambury in bianco e nero colorata - n°1 cartolina raffigurante Barnhieri in bianco e nero colorata - n°1 cartolina raffigurante Miss Grace Moore in bianco e nero colorata - n°1 cartolina raffigurante Vampa in bianco e nero colorata - n°1 cartolina raffigurante Vera Ledot in bianco e nero colorata - n°1 cartolina raffigurante Miss Robinson in bianco e nero colorata - n°1 cartolina raffigurante Chavita in bianco e nero colorata - n°1 cartolina raffigurante Ada Battke in bianco e nero colorata..
Ozma of Oz. 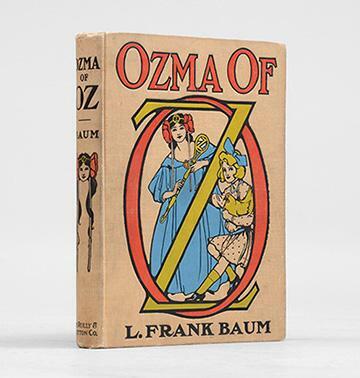 A Record of Her Adventures with Dorothy Gale of Kansas, the Yellow Hen, the Scarecrow, the Tin Woodman, Tiktok, the Cowardly Lion and the Hungry Tiger; Besides Other Good People too Numerous to Mention Faithfully Recorded Herein. ORIGINAL PEN AND INK DRAWING OF A LITTLE GIRL FROM "SONGS OF LOVE AND PRAISE". (Artwork). Date unknown, circa 1907.. By the prolific illustrator Charles Robinson, elder brother of William Heath Robinson, circa 1907. Landscape format, image size 37 x 129 mm, 1 5/16 x 5 1/16 inches, very pretty picture of a little girl holding a single flower and looking towards a window with a round arch at the top, with a view of clouds and trees. Clean and bright in a large cream mount. Not signed. Songs of Love and Praise by Annie Matheson was first published with Charles Robinson's illustrations by Dent in 1907. Price includes VAT. MORE IMAGES ATTACHED TO THIS LISTING, ALL ZOOMABLE, FURTHER IMAGES ON REQUEST. POSTAGE AT COST.